Agua fresca is a traditional Mexican drink that can be made from ripe fruit, like pineapple or mango, or from hibiscus blossoms or even tamarind pods, to name just a few variations. At the market, it is typically sold ladled from giant glass jars. The concept translates perfectly to an outdoor barbecue setting. For guests who are refraining from beer or wine, it makes a welcome change from lemonade or iced tea. This one, called agua de sandia, is made from sweet watermelon. Simply whiz the fruit in a blender, then add sugar to taste (not too much) and thin with a little ice water and a squeeze of lime. It can accompany absolutely anything that comes off the grill. 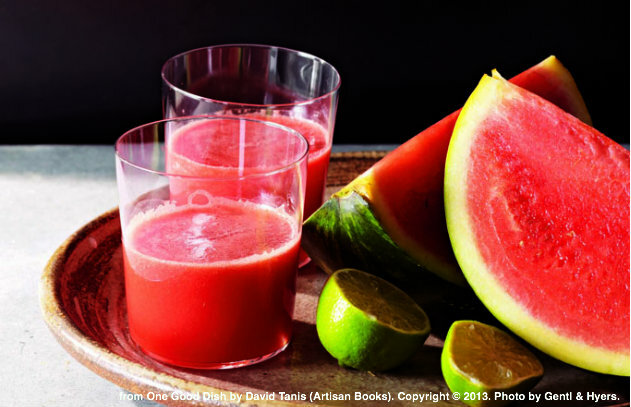 Try agua de sandia with spicy ribs or wings for a most refreshing, thirst-quenching summer beverage. In batches, puree the watermelon in a blender, adding a little cold water if necessary. Pour the watermelon puree into a pitcher, add the lime juice and sugar, and stir. Taste and adjust the sweet-and-sour balance. Thin with more cold water if you wish, and refrigerate until chilled or keep on ice. Save this recipe to ZipList. Find more delicious recipes in One Good Dish by David Tanis.